This romantic bouquet of white and blue flowers will tell your loved one they make you feel like youre on cloud nine. Perfect for anniversaries. 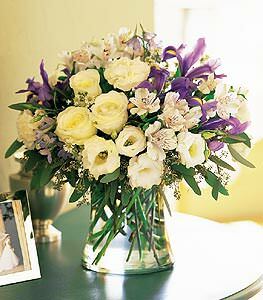 Alstroemeria, carnations, delphinium, roses and iris delivered in a striking clear glass vase.